Throughout Alberta, teachers in nearly every school jurisdiction have created DEHR Committees to promote Diversity, Equity, and Human Rights in our communities, and Lethbridge is no exception. The Alberta Teachers' Association Local 41 (Lethbridge Public Schools) has an ambitious DEHR Committee that works hard to strengthen our community and provide a voice for marginalized and disadvantaged people in our population. 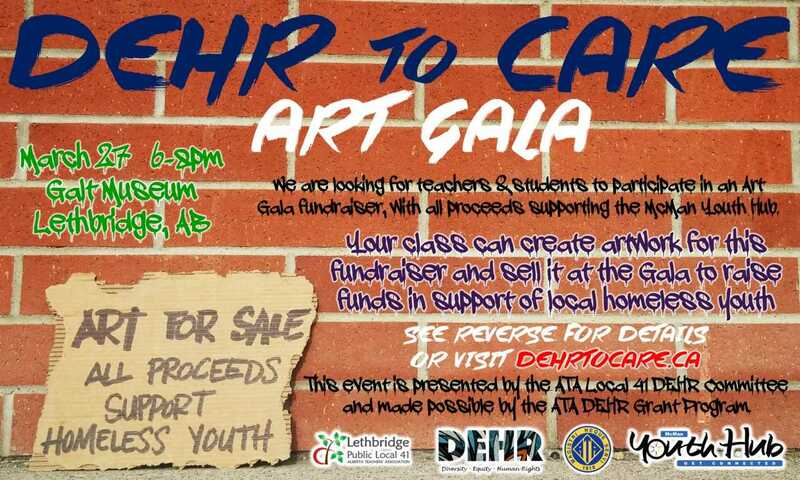 In addition to our regular duties--from providing literature and resources to participating in our local Pride parade--the Local 41 DEHR Committee has hosted an annual Art Gala event for the last three years, with tremendous success. 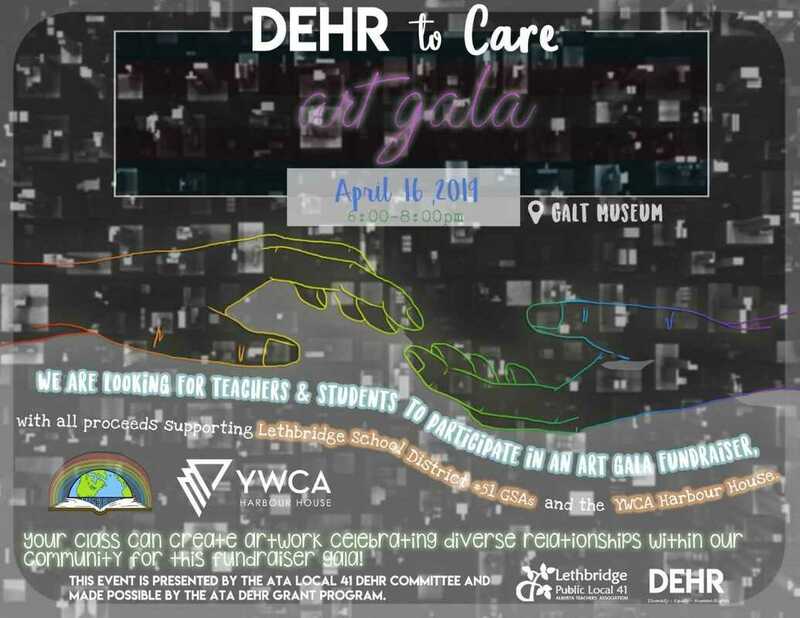 ​In 2016, the inaugural "DEHR to Care" Art Gala invited local teachers and students to explore the theme of "The Refugee Experience." Over 700 students, spanning Grades One through Twelve, from several different schools across three different jurisdictions, accepted our invitation, creating unique and outstanding artistic interpretations of the Gala's theme. We displayed and sold the art pieces at a Gala event, raising over $5,000 to support local immigrant and refugee children and youth. The "DEHR to Care" 2017 Art Gala was focused not on refugees, but on the shared history and the shared future of Canada's Indigenous and non-Indigenous peoples. With 2017 marking the 150th anniversary of Confederation, our DEHR Committee wanted to recognize that the widespread "Canada 150" celebrations should be accompanied by an acknowledgement that, in Gord Downie's words, "We are not the Canada we think we are." Bearing that in mind, our theme was "Becoming the Canada We Want to Be," and we invited local teachers and students to explore this concept. Again, we received hundreds of submissions and we hosted a live Gala event, raising over $4,000 to provide Lethbridge public schools with literature kits to further develop our understanding and appreciation of First Nations, Métis and Inuit cultures, histories and perspectives. The 2018 "DEHR to Care" focused on raising awareness and support for homeless youth in Southern Alberta. The 2018 gala had participation from almost 1000 students, across three school districts. Over $5800.00 was presented to McMan Youth Hub. The event was very well attended, with over 700 community members attending. The feedback from educators, students, attendees, VIPs and, most importantly, those from the Youth Hub, was overwhelmingly positive! This year, we are proud to announce that we are once again hosting hundreds of students, their families, and members of the local community to celebrate student artwork with the focus of 'Diverse Relationships' on April 16th, 2019. The gala will once again be held at the Galt Museum. Please feel free to share details of the event and follow us at @dehrtocare on twitter for updates.